Way back in 1969 a show called Sesame Street hit US TV screens - the following year the British media debated the merits of allowing the nation's children to be given access. The BBC eventually decided it was too 'brash and vulgar' so some of the ITV franchises (HTV, LWT, Grampian and Granada) agreed to trial the show in 1971 / 2. Thames Television had other ideas: they would produce their own show. 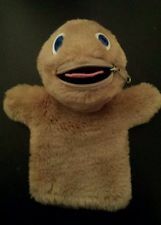 (Though the Scarfolk blog has a great alternate origin story...) The first episode, featuring Zippy, a creepy looking Bungle, and presenter David Cook, aired on September 1st 1972 with music from Telltale, the band who also wrote the theme tune. From that point on the show ran pretty much unchanged until 1992, when Thames Television lost its ITV franchise licence to Carlton Television. Tetra Films, a company founded from Thames TV's children's department, revived Rainbow in 1992 - without Geoffrey or Rod, Jane and Freddy - which lasted two series. In 1996 there was another attempt, presented by Dale Superville, but that lasted just one series. In total Rainbow had 26 series with over 1000 episodes. 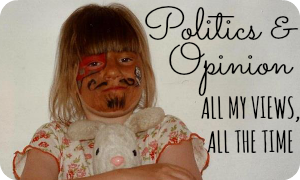 For a taste of the antics the gang got up to, check out the World of Crap blog. Rod, Jane and Matt with Geoffrey, George, Zippy and Bungle, c. 1974. MERCHANDISE Thames TV were slow to realise the marketing potential of their new kids' show. The first item available was probably the 1973 vinyl LP 'Songs from the Thames Television Children's Programme "Rainbow"'. Snappy title, huh? More albums followed: Rainbow (1975), The Bumper Rainbow Album (1976), and Rainbow Songtime (1980). Telltale also released the theme song as a single in 1973, while Rod, Jane and Freddy released their own Christmas single in 1981. In 2002 a CD single release of dance remixes was released featuring Zippy or George on the cover - it even reached the UK top 40. In addition to the ubiquitous annuals Thames TV issued a weekly Rainbow comic in the early 1990s and, to tie in with the 1996 revived series, a few issues of a comic called Rainbow Days were published. For the grown ups there is Rainbow Unzipped, a spoof celebrity memoir written by Tim Randall in 2009. All the Rainbow annuals: 1980 - 1994. So far we have '82 and '89. The most exciting development was Rainbow on home video - now you could watch your favourite episodes over, and over, and over (and over and over) again. VHS releases included Christmas Pantomime (1988), Music (1989), Make & Do (1990), and Seaside Show (2000). 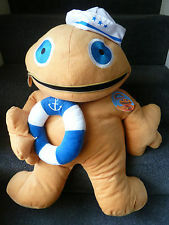 There are also quite a few DVDs available: Zip-Up Zippy (2001), 30th Anniversary Special (2002), Super Bungle (2008), Zippy's In Love (2008), My Mate Zippy (2009), Zippy Sets Them Up (2009), I Want To Be A Popstar (2010), Naughty Zippy (2010), Songs, Rhymes, Stories and Tales (2010) Rainbow also features on the 2002 Cult Kids Classics DVD. Rainbow DVDs. We have Zippy Sets Them Up, 30th Anniversary, and - by far the favourite - Songs, Rhymes, Stories and Tales. 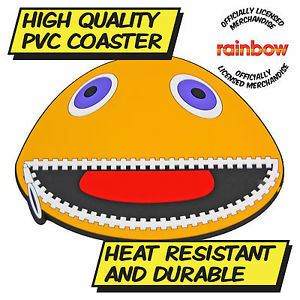 Homewares aren't forgotten when it comes to Rainbow merchandise. You can get various mugs, along with other officially licensed products ranging from pencil cases to coasters to magnets to a Zippy trolley coin. A few years back there was also a range of Rainbow greetings cards - I've got Marianna a 'Happy Birthday' one from eBay. Sites like Redbubble also enable you to get Rainbow themes notebooks, t-shirts, keyrings, badges and more. 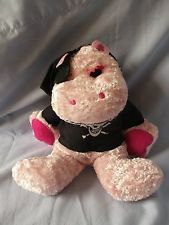 You can get THIS awesome cushion too from 2001. 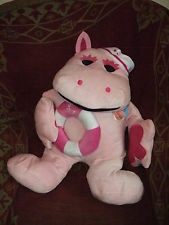 During Rainbow's actual run the soft toy options were few and far between. 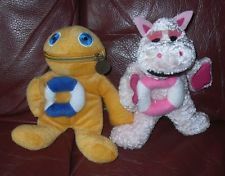 There was a dubious looking Zippy soft toy and hand puppet and, well, that was it. 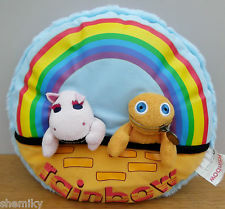 Thankfully Rainbow was at the heart of the 2000s kids TV nostalgia craze, which meant the market was soon flooded with Rainbow plushies. 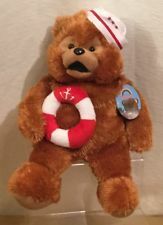 There are giant (24") Bungle, George and Zippy; beanie versions (pictured); talking veriosn; and plush keychains (pictured). 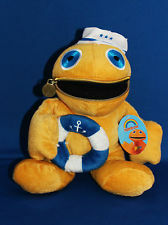 There are also themed plushies with pirate Zippy (pictured) and George; small 7" sailor Zippy and George; medium 12" sailor Zippy, George (pictured) and Bungle; large 24" version of sailor Zippy and George; medium sized plushies with hearts; and small, medium and large versions of the trio in dressing gowns. 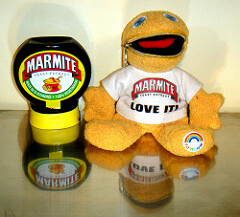 You can even get a Marmite Zippy, from his time in the 2002 love / hate campaign. 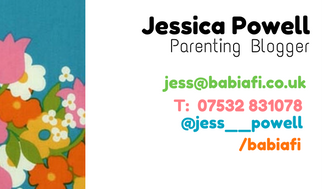 Sometimes you want the whole world to know about your love of retro kids' TV shows. Rainbow has you covered. You can get wallets, hand bags, shoulder bags, and backpacks. For some that's just not enough. 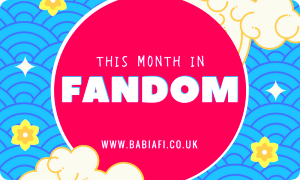 These diehard fans can share their passion via the medium of Rainbow cakes, cufflinks, face masks, full body suits, and jumpers lovingly knitted to retro patterns. You can get t-shirts, jumpers, and stuff like that from Redbubble and so on too, but they can't compare to this selection. If you want something more low key, there are plenty of embroidered patches, keyrings and badges out there to show your love in a less, er, prominent fashion... The bottom row are the vintage 1980s badges. I didn't include the unofficial badges, keyrings, etc, available but there are loads of those out there too. Did you ever watch Rainbow? And do you own / have you owned any of the merchandise? Mine too - makes it easier to deal with the constant replaying of the DVDs lol. There really is loads - I was surprised at all the bags and stuff, especially. A random question. Who did the artwork for the intro?